How to Market to your Donors Before, During, and After a Fundraising Event via Mobile. You’ve pretty much run the gamut. 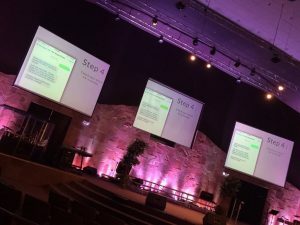 Let us tell you all about how you can use mobile to market to your donors before, during, and after an event (for more tips on how to ask for donations anytime, check out this article. We’ve got 6 steps for you to take. Before your fundraising event, you’ll need to prepare your strategy so that when you unveil it all during the event, everything will work as it should. There’s (seemingly) an app for everything. Did you know that there’s an app that allows you to pop virtual bubble wrap on your phone? Pretty wild, right? That being said, you don’t necessarily have to build your own revolutionary iPhone app in order to get the most out of mobile fundraising. You do, however, need to have a mobile-responsive website. These days, the most widely and frequently used app is not Facebook. It’s the plain old internet browser. You know, the one that comes standard on every phone? If your website doesn’t perform as it should on a 3×5 inch screen, over 40% of users will switch to another nonprofit’s site. When your site is mobile-responsive, donors are exponentially more likely to commit to a donation than if your site doesn’t function well on a mobile device. In fact, studies show that 70% of searches for nonprofits using the web app on a mobile-responsive site lead to action (donating, subscribing, etc.) within the hour. When you’re planning an event with mobile in mind, you have to make sure that donating via your website is as seamless as possible for all users. When you’re planning your next event, whether it’s a bowl-a-thon or a rock concert, seek out the help of your most vocal supporters first. These vocal supporters can be advocates, volunteers, board members, whoever! As long as they’re passionate about your cause and want to help you out. How do you enlist the help of your advocates to further your mobile fundraising campaign? Send them an invitation to participate in something new. Something no one else has yet done. Have them pilot your mobile fundraising platform. Ask their honest opinions. If they’re on board with your plans, you can feel confident to move forward and introduce mobile to the rest of your donors. However, if they have questions or suggestions, be sure to address them and improve your strategy accordingly. In addition to having them test out your beta mobile fundraising campaign, you can also make the most of your relationships with these advocates through peer-to-peer fundraising. Anyone they pass on the street! With your supporters on your side, you’re ready to start preparing for the actual event itself. During your fundraising event, you can make direct asks and market your plans in person. Live events are some of the best venues for asking for donations. Imagine you’re hosting an event. It’s a concert. Everyone is grooving along with the beats. People are dancing, having fun, and enjoying themselves. Some people have even pulled out their mobile phones to hold up and sway along with the rhythm of the music. Now is the perfect time to take advantage of the fact that most people never leave home without their phones. Whenever there’s a break in the event, be sure to set this time aside for explaining your mobile fundraising plans to your phone-toting event attendees. 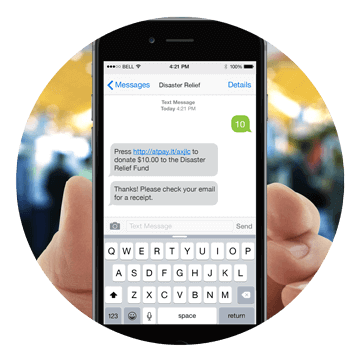 Walk your participants through texting to donate to your organization, step-by-step. Pass out flyers with QR codes so that your attendees can scan them with their phones and easily donate that way. Invite your participants to “like” your organization’s Facebook page on their mobile phones. Did you know that you can donate to an organization directly through Facebook? Encourage attendees to check out your mobile-friendly website (and your mobile donation page, while they’re at it!). The possibilities are endless. Make sure you take full advantage of this opportunity! As an inherent part of mobile fundraising, you’ll be collecting a ton of information. This can be overwhelming, but there are ways to make it less so. Designate one person (or a team, depending) as the information collector(s). Make sure you have a system for dealing with all of the new information as it comes in. Decide beforehand what you’ll do with duplicate information. Have a plan in place for dealing with inaccurate information or inconsistent information. As long as you (and your staff) know what you’re supposed to do in any given scenario, collecting mobile information at a live event doesn’t have to be nerve-wracking. While it can seem overwhelming at times, having an influx of new donor data can also be tremendously exciting. Why is it so exciting to be collecting all of this data? Promote your next event via email. Send direct mail newsletters to update your new donors. Connect with your donors on Facebook, Instagram, and Twitter. Staying in touch with your new donors is a guaranteed way to keep them coming back to your organization’s events. After your fundraising event, you’ll want to keep in contact with your attendees in order to foster positive relationships. Since you’ve spent the time and energy collecting the information from your event’s attendees, it’s important to make good use of these new contacts. Of course, each way you choose to connect with your attendees comes with certain rules and best practices. When is the best time to follow up? Facebook: The best time to engage with potential donors on Facebook is anytime between 1 PM and 4 PM during the workweek. The worst time is before 8 AM or after 8 PM on weekends. Email: The optimal time to send an email is 2 PM on a workday. The worst time for emailing is Monday morning. Twitter: The best time to tweet is Monday-Thursday 1 PM to 3 PM. Fridays after 3 PM are the worst time to engage with your Twitter followers. Instagram: The absolute best time to post a photo (with a link to your online donation page, of course) is Wednesday at 5 PM. Sundays are not favorable for posting on Instagram in general. How should you approach each mode of communication? Facebook: Photos and short videos grab the most attention. You’ll have the least success with text alone, especially if you have large blocks of uninterrupted text. Email: Mobile-responsive emails that have some sort of visual element and a very clear call-to-action provide the best response (and have been proven to lead to a higher conversion rate). Twitter: Keep it short, sweet, and humorous on Twitter. Much like email, having an obvious call-to-action is a best practice. Instagram: Make sure that your pictures are high-quality. Grainy, out-of-focus pictures aren’t engaging for donors. If you follow these best practices, your nonprofit is sure to see engagement rise. Don't forget to include an obvious link to your online donation page. Did you know that your nonprofit could be eligible for free advertising from Google Grants? You already know that you should always make it a habit to thank your volunteers. The same is true of your donors! Don’t just thank them for their donations. Thank them for their attendance. Let them know all about your next event. Send them an invitation! Not only are they supporting your organization with their monetary donations, they’re supporting you with their words and their gestures and their involvement with your nonprofit. So thank them more than once. And in more than one way. If you send a thank you email, be sure to send a handwritten thank you note as well. If you thank your mobile donors with a text, be sure to follow-up later with an email thanking them for their time and contributions. How you thank your donors is 100% up to you, but keep in mind it’s one of the most important steps in retaining new donors. Make each “thank you” count, and you’ll be sure to count more and more donors on your nonprofit’s books. We hope you learned something valuable, and we’d love to hear from you any advice you may have on the subject. What works for your organization? What doesn’t? 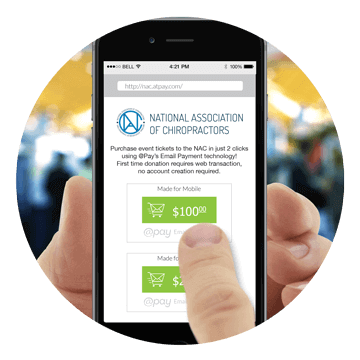 Is your organization familiar with mobile fundraising? What are some best practices you’ve picked up along the way? Guest Post by Eric Griego. Eric is the Director of Business Development at @Pay, a simple and secure giving platform that provides donors a seamless way to give on a mobile device. He has implemented effective fundraising strategies for hundreds of Nonprofit & Church organizations. In his spare time he roots for the Denver Broncos while enjoying a nice craft beer.